I know many of us are committing to eating better. I get tons of questions about different cleanses and fasts, but my approach to nutrition is simple: I try to eat from a plant, tree, or animal at every meal. I avoid highly processed or pre-prepared foods as much as possible. 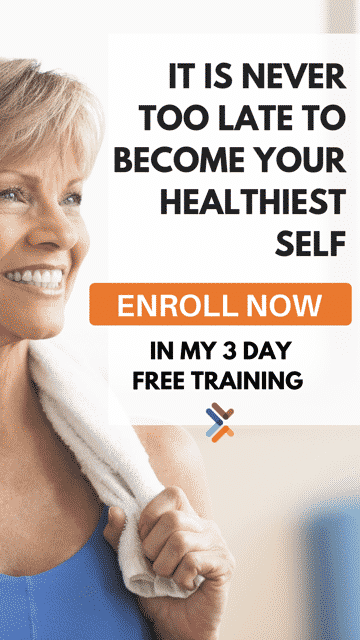 I avoid quick fix detoxes, radical cleanses or empty promises from companies trying to cash in because I believe that if you eat well, your body will take care of itself. One nutrition trend I am a big fan of is juicing! Juicing has become quite popular in the last 10 years popping up in local strip malls, cafes and gyms because, simply, it makes people feel good. And while I don’t recommend a juicing meal plan necessarily, drinking fresh juice alongside healthy eating habits is an easy way to ensure you are getting your recommended servings of fruits and vegetables. Oh, and it tastes great! Yes, juicing is delicious, and you may be surprised as to how easily you to will become obsessed with this healthy habit. I personally add fresh juice to my diet and do not advocate juice cleanses or fasts that eliminate whole foods. 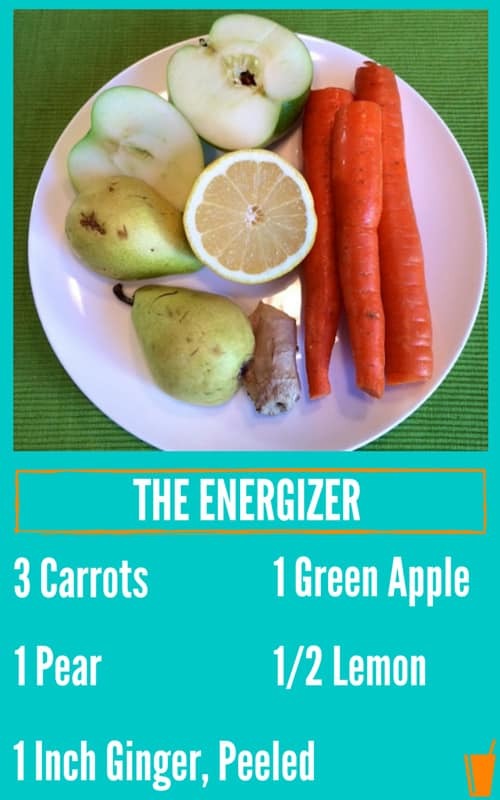 But, juicing may be the quickest way to add nutrients to your body and feel totally energized. 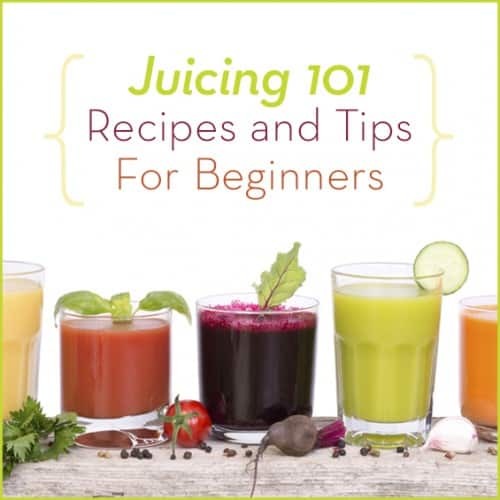 I put together my nine favorite juicing recipes to share with you along with a few juicing tips to get you started! An affordable option that gets great reviews is the Big Boss 700-Watt Juicer that retails for around $60. Get Healthy U contributor, Hannah, loves hers and says she is surprised by how great it works for the low price. A middle of the road option is the Breville Juice Fountain Plus at 850 watts that retails for around $150. 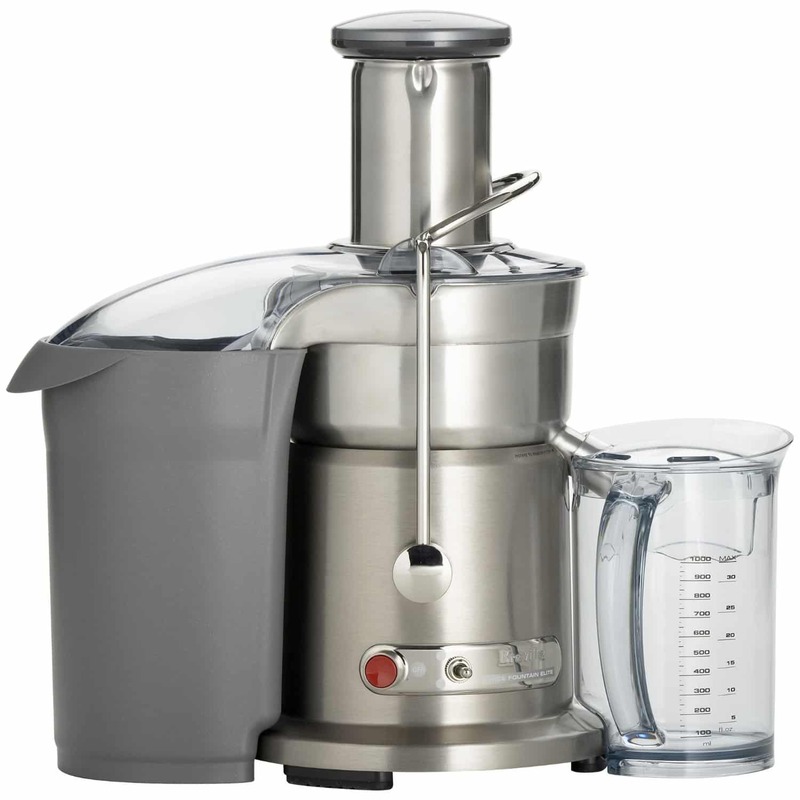 A little more pricey is the Breville Juice Fountain Elite with 1,000 watts of rocket like power. This is a commercial grade juicer, so if you plan to juice a ton, this is the juicer for you. It retails for $299. This is the juicer I bought 10 years ago and although it wasn’t cheap, it may be one of the best investments I have ever made. Read your manual. Typically, I’m not a huge fan of “reading directions” and most often just figure appliances out on my own. . Trust me, you should really read the manual in this case. My juicer comes with a low and high setting that I can adjust for different vegetables. My manual has a list of those veggies and what speed they should be juiced at for optimal results. Also, if you get a big daddy juicer like I have, you really need to make sure all the pieces are together correctly so you don’t accidentally juice a finger. Be prepared. Find two to three recipes to try and shop for those ingredients all at once. Try to use the 80/20 rule for juicing. Try to think 80% veggies and 20% fruit for most of your juices to keep sugar content low. You will want to remove any skins that are inedible (such as mango skin and citrus peels), large seeds or pits and wash all of your produce well. The point of juicing is to enjoy the fresh juice right away. Fresh juice will lose nutrients as it oxidizes, so plan to drink your juice immediately. If you make extra or can’t drink it all at once, store your juice in an airtight container like a thermos or mason jar, filling to the top and making sure it’s sealed. Make sure to refrigerate it ASAP. Fresh juice will keep for up to 24 hours, but I try to drink mine in under 12. I typically drink my juice for breakfast or as an afternoon pick-me-up. Drinking juice on an empty stomach is best as those nutrients are absorbed right away and don’t have to fight with other foods your body is trying to digest at the same time. Related: Juicing vs. Blending: Which Is Better For You? Have fun. I have tried tons of juice recipes and then made my own adaptations based on my taste. Try new fruits and vegetables and get your friends and family involved. Don’t be afraid to experiment with cooky concoctions. Who knows? Maybe beet and broccoli is the next big thing! Now let’s get started. Juice your way to better health with these 9 tasty recipes for one! The perfect mix of sweet and tart. 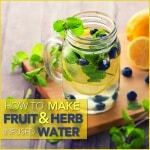 This fresh drink filled with vitamin C also has fresh lemons to help balance your body’s pH. Even if you don’t like beets, you have to give this juice a try! The apple and carrots are sweet balancing the earthy beet flavor. Beets are a superfood that help detoxify the skin and kidneys, contain important folic acid and are filled with betacyanin known to prevent cancers and increase exercise endurance. Tip: Wash the beets well and cut into pieces that will fit into the juicer. 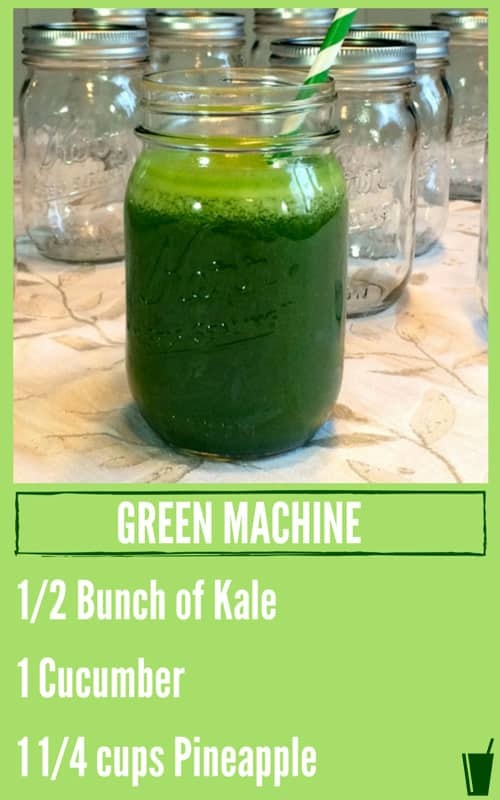 So refreshing and delicious you won’t believe you’re drinking kale! The sweetness of the pineapple makes this drink feel like a treat. The green machine is filled with vitamin B and iron that leaves you energized and ready to take on the world. 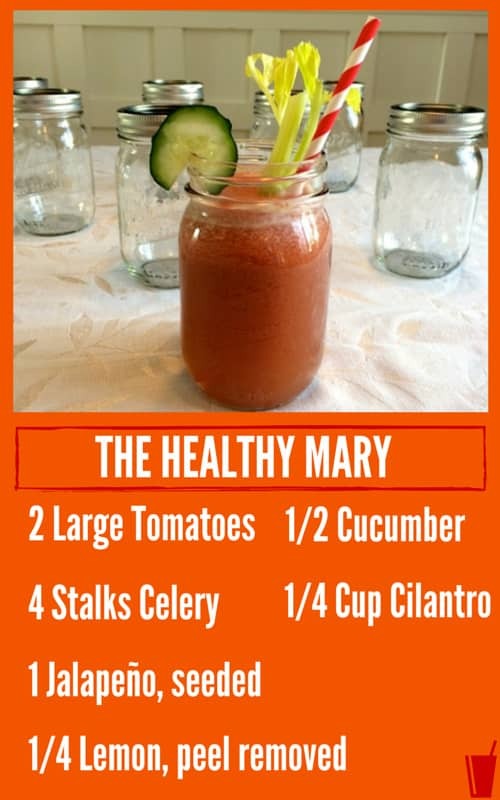 This is the Bloody Mary’s healthy sister! You haven’t had real tomato juice until you make it fresh and add a little kick to spice things up. Tomatoes are rich in beta-carotene and lycopene both known to reduce the risk of heart disease and strokes. Good morning, gorgeous! I love the vibrant taste of fresh citrus in the morning. The vitamins and minerals get my blood pumping and the smell and taste really wake me up. I also add a little club soda to the recipe in the summer to make a healthy spritzer on hot days. Yum! 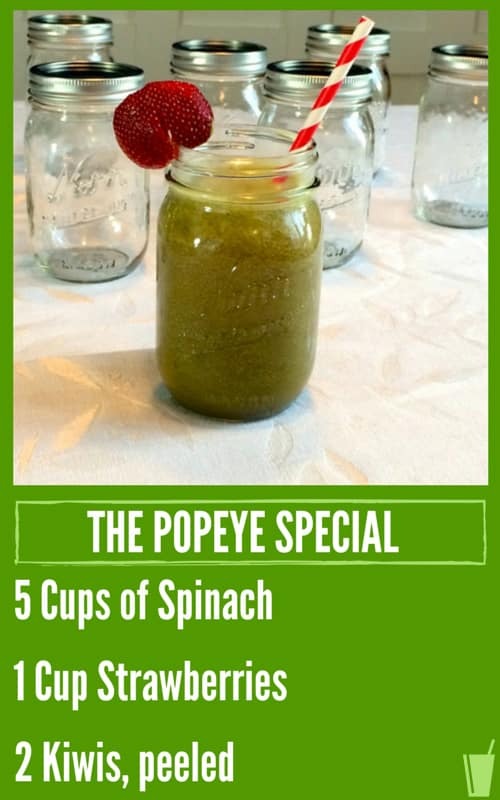 If you have a hard time “eating your spinach,” this is the juice for you! I add strawberries and kiwi to sweeten the spinach up and the combo tastes incredible. Plus, the juice is filled to the brim with iron, vitamins and micronutrients to you make you as strong as Popeye. 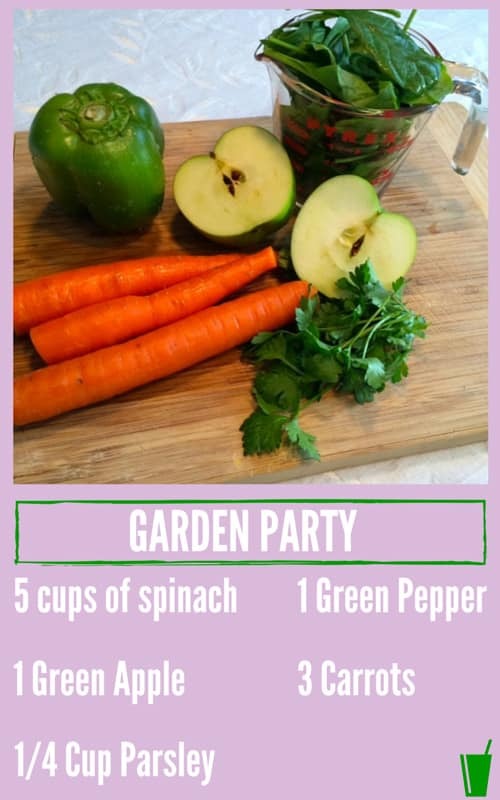 Get your garden party on with this veggie-packed juice! 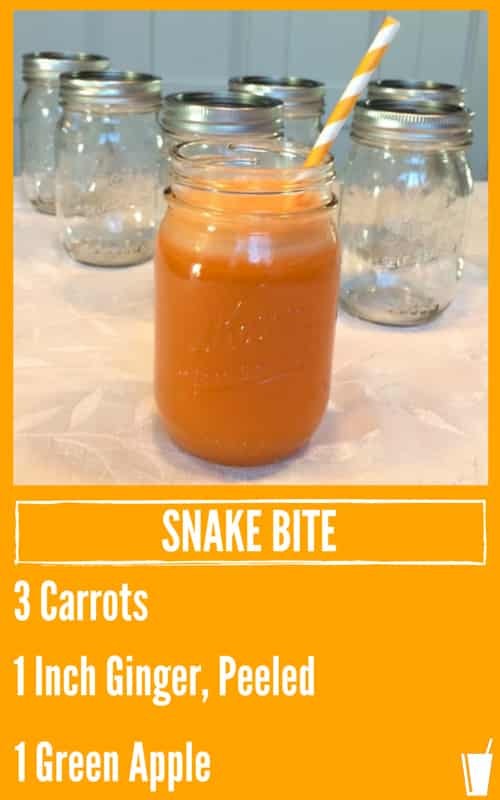 The beauty of juicing is that when you use carrots or apples, the other super healthy but strong flavors such as parsley and green pepper aren’t as pronounced. 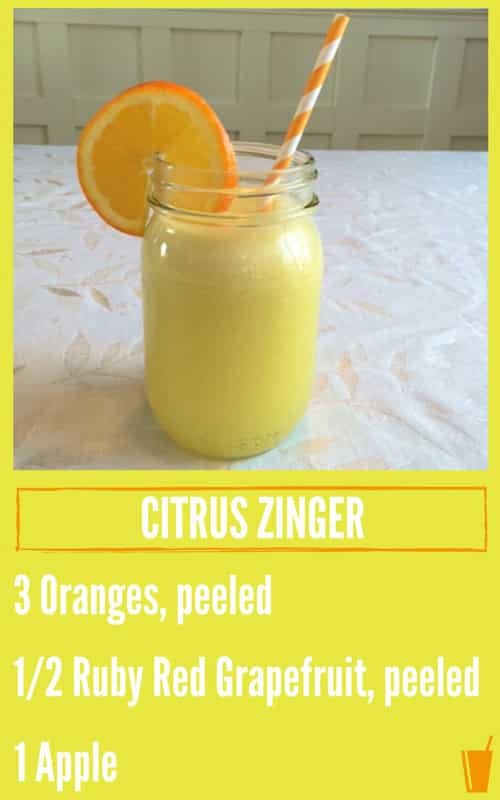 One of the first juices I’ve ever made and still my kids’ favorite. The Snake Bite is sweet but the fresh ginger gives it a healthy bite! Fresh ginger raises immunities and is also known to improve digestion and circulation. 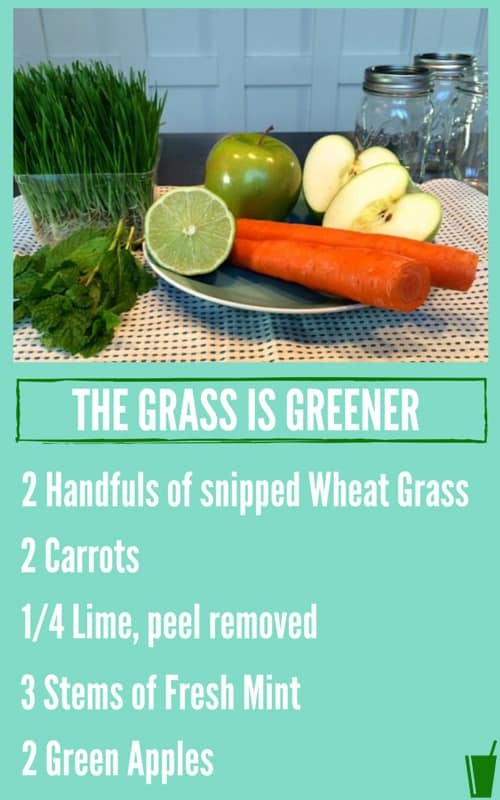 Wheat grass is full of vitamins and nutrients that help boost immunity and energy. The combination of wheat grass and vitamin C-rich lime makes this juice the perfect flu and cold fighting formula to keep you Kleenex free. Mint is also known to clear up congestion and is a natural stimulant so if you feel the sniffles coming on, this is the drink for you! Note: Pregnant or nursing mothers should not consume wheat grass. Here is to fresh juice, more energy and better health! Recipes of these juice and smoothies looks great. These are some of my favorite juice and smoothie recipes :) You'll have to let me know if you try any of these and which one becomes your favorite! Happy juicing!! Thanks for sharing! I love my breville juicer! It is so great! If you make a bigger batch of one juice. How long will it last in the fridge? Homemade juice doesn't have too long of a shelf life unfortunately as it loses it's nutrients quickly. If you are storing some, the recommendation is to fill up an airtight container (the less oxygen, the less nutrients will be depleted) and store for 24-48 hours. Hope that helps! I'm brand new to juicing, have not made a recipe yet but intend to. My question is do I have to buy a juicer or will my blender that I use for milkshakes and cocktails suffice? Hi Terrie - yes, juicing is something different - your blender won't be able to separate the juice from the pulp of the fruit or vegetables so that will just be able to make a smoothie. If you truly want juice, then you'll need to get a juicer! 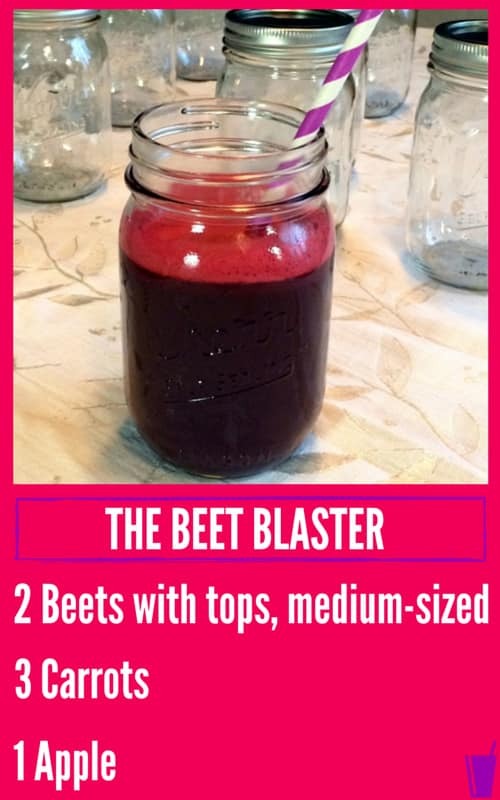 Question: the recipe for the beet blaster says to use the tops, but the video doesn’t show the tops being used. Which is it? Hi Tina - sorry about that! We actually have made it with and without the tops so you can do whatever you'd like! I love the Green Party recipe! It fits best and produces lots of juice with my cold press juicer! I bought a slow masticating juicer because I thought it was better. Is that not true? Please help! I bought the Breville from the link you have in your site, I love it!! But.... I have a few questions. What speed (low or High) donyou juice your leafy greens on (kale, spinach). Also, it’s seems like my peeled orange just spit right through the first time, without really juicing it. I saw where you have had this juicer now for 10 years, so I am sure you hold all of my answers! Thanks in advance! Hi Jennifer - the Breville actually does come with instructions that say what veggies and fruits should be uses at high or low speed. I usually do low for greens :) Hope that helps! I started juicing a few months back. I know I'm still a newbie. Hope this one help me to improve! It's a worth reading. Thanks, Chris! !